Whether you are an aficionado of the wildly colored, formed and sublimely flavored heirloom or a grab-and-go supermarket tomato consumer, all tomatoes owe their existence to wild tomato plants. What are wild tomatoes? 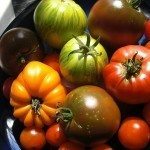 Keep reading to learn about wild tomato information and about growing wild tomatoes. Known to botanists as Solanum pimpinellifolium or quaintly “pimp,” wild tomato plants are the ancestors of all the tomatoes we eat today. They still grow wild in northern Peru and southern Ecuador. No bigger than a shelled pea, pimps and their other wild tomato relatives, like wild currant tomatoes, are extremely adaptable and can survive in some of the driest, harshest desert regions to humid, rain-filled lowlands to chilly alpine heights. Can you eat wild tomatoes? While these little tomatoes are not as widespread as before, IF you did happen across some wild tomatoes, not be confused with volunteer garden tomatoes that have simply popped up elsewhere, they would be totally edible and quite flavorful, with a bright orange-red color. Pre-Columbian denizens of what is now southern Mexico planted and cultivated wild tomatoes. As they were growing wild tomatoes, farmers selected and saved seeds from the biggest, tastiest fruit and cross bred them with others having more desirable traits. Spanish explorers then took these seeds to Europe, further separating the wild tomato ancestor from its rapidly changing progeny. What that means to us is that modern tomatoes may look good, even taste good, but lack the survival skills of their ancestors. They are more susceptible to diseases and insect damage than their predecessors. Unfortunately, because of industrial agriculture in its native regions that includes the use of herbicides, the little pimp is rapidly losing ground and is becoming as uncommon as any other endangered species. Seeds for the ancestral tomato can still be found online and are typically grown as a perennial. Mature wild tomatoes will grow to a height of about 4 feet (1 m.) with a vining habit.